The global market for gastrointestinal drugs is highly consolidated for the three-most prominent players account for a substantial share in the market. Valeant Pharmaceuticals Inc., Takeda Pharmaceutical, and Janssen Biotech Inc. are the top three players. Together they accounted for 61% share in the market in 2016. Currently, the global market for gastrointestinal drugs is characterized by a moderate degree of competition. In the near future, however, the competition would likely intensify, predicts a report by Transparency Market Research. 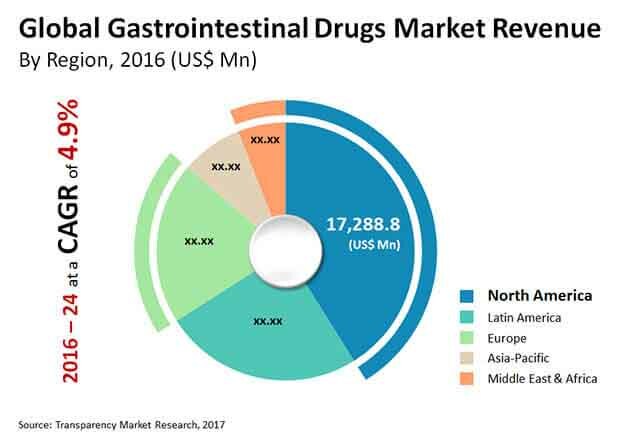 According to the research study, the global gastrointestinal drugs market was valued at US$45.5 bn in 2015 and will likely attain a value of US$61.1 bn by 2024-end by expanding at a steady 4.90% CAGR. The different classes of gastrointestinal drugs available in the market are acid neutralizers, antidiarrheal and laxatives, antiemetic and antinauseants, anti-inflammatory drugs, and biologics. Among them, acid neutralizers have been seeing maximum demand because of the growing prevalence of gastroesophageal reflux disease (GERD). On account of its relatively affordable price, it is likely to enjoy robust demand in the years to come as well. Geographically, the key segments of the global market for gastrointestinal drugs are North America, Latin America, Asia Pacific, Europe, and the Middle East and Africa. North America, among them, is a dominant region due to favorable reimbursement policies for the treatment of the chronic diseases. In 2016, North America accounted for a share of 41% in the global market for gastrointestinal drugs and going forward too, is predicted to hold on to its leading position because of the rising number of elderly people, who are highly susceptible to gastrointestinal diseases. Europe trails North America in the global gastrointestinal drugs market and will likely retain its position in the years to come because of the emergence of biosimilars for patent-protected brands available for the treatment of inflammatory bowel disease. Asia Pacific is already proving itself to be fast growing market because of the gigantic strides made in medical and healthcare infrastructure, growth in investments – both public and private – in life sciences research, and technological progress in treatment methods, particularly in emerging economies of India and China. “The global market for gastrointestinal drugs derive much of its growth from the increasing prevalence of gastrointestinal diseases across the world,” says an analyst at TMR. As per a report by the World Gastroenterology Organization, the occurrence of gastro-esophageal reflux disease (GERD) is rather high globally. This along with increased level of awareness about the treatments and focus on further drug development has been majorly boosting the market. “On the other hand, the unknown etiology of IBD and IBS and the dearth of a permanent cure for gastrointestinal drugs may restrict the growth of this market in the years to come. However, the continual technological advancements in the treatment therapies are expected to impact positively on this market in the long terms, notes the study,” explains the lead analyst of the report.